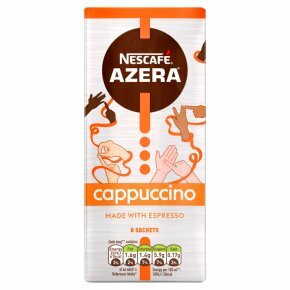 NESCAFE Azera Cappuccino: We all love barista style coffee and you can now enjoy your coffee shop favourites in an instant! A delicious blend of instant coffee and finely ground roasted coffee beans with an intense aroma topped off with a velvety froth. Espresso-based cappuccino sachets for barista-inspired coffee. Made with espresso. Prepare your velvety cappuccino in moments from a single-serve sachet. Topped with a smooth, velvety froth. Quality coffee whenever, wherever and however you want.Calling all cappuccino fans: if you love full-flavoured, barista-quality coffee with plenty of froth, we've got you covered. Create barista-inspired cappuccinos at home with NESCAFÉ AZERA Cappuccino sachets. Just add hot water and stir to enjoy full-flavoured espresso-based coffee topped with a deliciously velvety foam. Crafted from a combination of instant and finely ground roasted coffee beans and British cows' milk, our cappuccino is the perfect partner - wherever, whenever and however you want it. Any time you want a delicious frothy coffee in an instant, the NESCAFÉ AZERA Cappuccino is here for you, froth-lovers. Part of our range of coffee shop favourites, the NESCAFÉ AZERA Cappuccino is mild but full-flavoured, and it's perfect if you love the deep coffee taste and textured foam of the classic cappuccino. If you love barista-style coffee and want to enjoy the perfectly balanced comfort of a great cappuccino at home, NESCAFÉ AZERA instant cappuccino sachets are for you. And, our coffee is responsibly sourced - so that you can feel great about every cup.